Sometimes, when you’re scrolling through online archival entries or flipping through dusty boxes of otherwise banal documents, you spot something that sticks out: something alarming. These documents are all the more tantalizing because of a lack of context – or just enough context to leave you wondering. “Cree cannibal executed at Fort Saskatchewan.” 1879-1880. Photographer: G.M. Dawson. Image from Library and Archives Canada. I had in fact sort of achieved my research goal: I had found a photograph of a Cree man taken in the local area. Fort Saskatchewan (at that time a NWMP post and prison), after all, lies between the Beaver Hills (where Elk Island National Park is) and Edmonton. However, I had stumbled upon a much more fascinating story than the one I had initially set out to tell… albeit one with minimal available details. What information I could find in the LAC database entry on this case is slim. The photo is apparently from 1879-1880, and taken by a person called George M. Dawson. From the accession number, this photo was acquired by the LAC in 1969. In the entry for the photographed of the chained man, under “additional information”, reads this tantalizing phrase: “ate his family.” According to the photograph title, this man was executed as a cannibal. Other files with the same accession number show images from the Canadian Geological survey, mostly from the 1890s onwards, of viewscapes and travelling scenes. Here, for instance, is a lovely undated photo of a train of horses at Jasper Lake. There appear to be thousands of these along a similar vein. 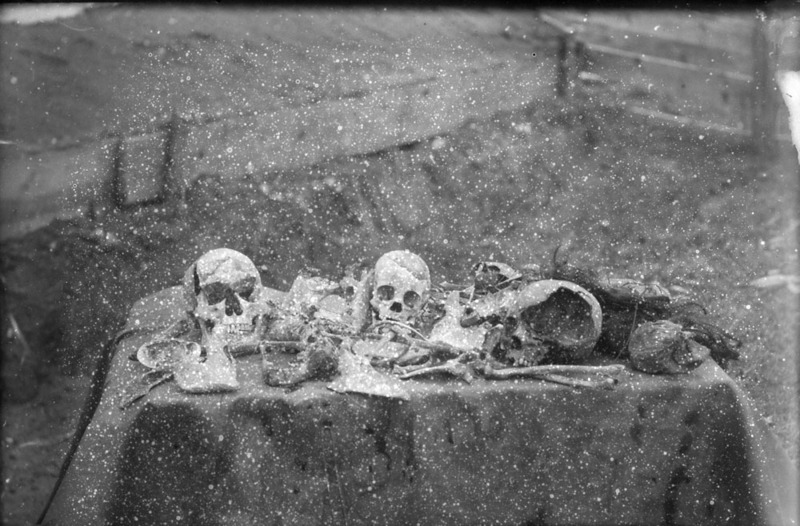 “Indian Bones, victims of Cree Cannibal, brought in as evidence by the Mounted Police. 1879.” Photographer: G.M. Dawson. From Library and Archives Canada. Again, very little information accompanies this gruesome image, especially not the reason why a photographer who apparently accompanies geological surveys would be in a position to take a picture like this. I can only speculate as to why these photographs were taken – it’s unlikely it was for a newspaper and too early to be put on a picture postcard for the ghoulish. (People did send postcards with morbid subjects, because human beings are terrible, but the popularity of photographic postcards didn’t take off until 1900 or so.) I do know that crime scene photography wasn’t really yet a thing, and anyway these bones look like they were retrieved and put on display. So at this point in my research, I still didn’t know much of anything about this specific case or the people involved beyond the captions provided by the LAC. I still didn’t know the name of the accused “cannibal” in the photograph. It was not uncommon for everyone in a photograph to be named except First Nations people, who were almost invariably labelled “Indian” or by their nation; white photographers didn’t often bother to find out the names of these peope as their racial identity was apparently enough of an identifier. What I do know is that there were multiple cannibal scares in what is now Northern Alberta in the last few decades of the nineteenth century. In this area fear of the Wendigo (cannibal monster) was very, very real, and people did die. What I found absolutely fascinating while conducting this research was the confluence of supernatural Indigenous explanations for gruesome behaviour like cannibalism (due to famine or insanity or both) and the newly imposed Canadian law by North-West Mounted Police. In short, in the late nineteenth century you had the unusual situation of Mounties arresting bogeymen and putting them on trial for murder. A Wendigo (or “wîhtikôw” in Cree) is a cannibal spirit that can take over a person and compel them to eat other people. According to my friend and fellow scholar Caitlin Elm, who is Tall Cree, when she was young she was told wendigos are so famished that they eat their own lips so they always look like they’re baring their teeth. Once they have tasted human flesh, there is no going back. Newspaper headline for an article recounting the Wendigo incident at Trout Lake described by historian Nathan Carlson. The Brandon Mail, April 30, 1896, Page 3, Item Ar00308. Courtesy of Peel’s Prairie Provinces. – “A Trout Lake Tragedy,” The Brandon Mail, April 30, 1896, Page 3. In the 1890s, people were being killed and eaten by wendigos, but other people were being charged by Candian lawmen for murdering those possessed by the cannibal spirit (sometimes before the monster could even kill anybody). At least one man – or wendigo – was executed in Fort Saskatchewan for his actions: the one photographed above. Now, I am not saying that the man in the first photograph was possessed by the Wendigo spirit. I’m also not saying that he wasn’t, or that others didn’t see him that way. After having written all of the above and trolled through as many photos as I could at Library and Archives Canada, I did a Google search and ran across an article from the Edmonton Journal with a copy of the above photograph. It had much more written detail than I was able to uncover, from documents held at the Provincial Archives of Alberta, including trial records. 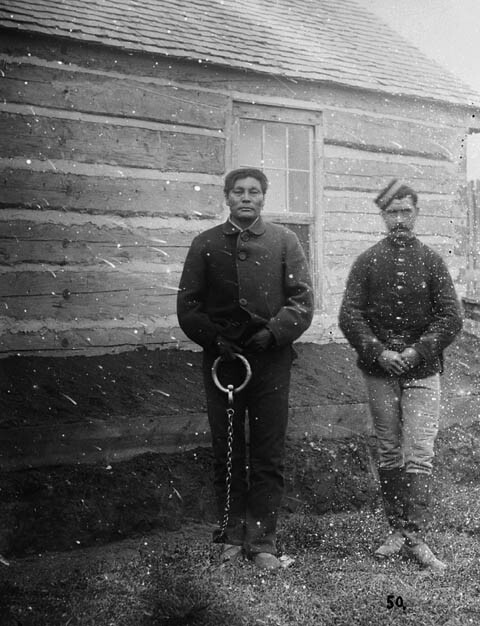 According to the article, the man in the photograph was named Swift Runner or Ka-Ki-Si-Kutchin and he was the first man hanged in Fort Saskatchewan. He was convicted and executed for the “murder and cannibalism of wife, mother, brother, and six children.” His wife is the only named victim: Charlotte. Swift Runner was hanged for his actions on December 20th, 1879, at 7:30 in the morning. “Searching for Catherine Auger: The Forgotten Wife of the Wîhtikôw (Windigo)” by Nathan D. Carlson. Recollecting: Lives of Aboriginal Women of the Canadian Northwest and Borderlands. Edited by Sarah Carter and Patricia A. McCormack. You can read much more about the investigation into the crime and Swift Runner’s execution here: “The first hanging,” Edmonton Journal, 2011. Last winter, I worked as a research assistant for an author writing a book on the Battle of the Somme. While I was at the Canadian War Museum, going through boxes and boxes of mud-splattered diaries and letters written on battered paper from a century ago, I ran across this surprising object. 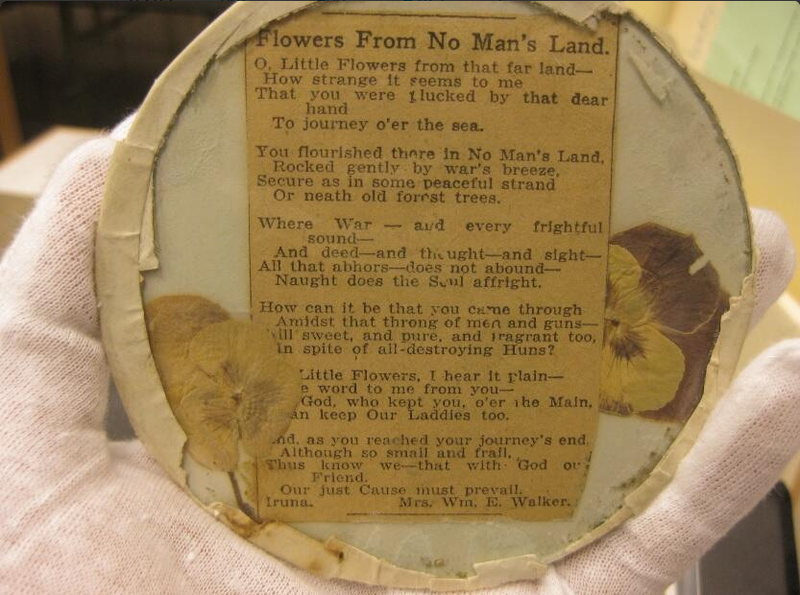 It is a little glass circle containing a clipping of a poem, perhaps from a newspaper, with pressed flowers, presumably from No-Man’s-Land. Holding it in my white gloved hands, I shivered. As friends and long time readers (and perhaps even long time readers who become friends?) have no doubt divined, I am currently an MA student in Public History at Carleton University in Ottawa. Before working at Library and Archives Canada (LAC) this summer, the only experience I had in archives was as a researcher. One of the advantages of my summer internship at LAC (aside from the long but gorgeous bicycle commute that takes me all along the Ottawa River, past the Chaudière rapids, Parliament Hill and the Rideau Falls) is getting a fresh perspective on archives. Namely, we interns have been learning a lot more about what goes on behind the scenes at archival institutions. We are the cogs behind the scenes making certain functions of the LAC run: we get to edit files at the “back end” of the website, spend a lot of time using the databases, get our hands dirty processing files that won’t be available to the public for quite some time, and of course we get the chance to visit other archives, storage facilities, and research centres in the area to see how such institutions are run in the National Capital region. I have now visited numerous institutions in the Ottawa area, both as a researcher and behind the scenes as an intern on a tour. They include but are not limited to: the 395 Wellington Street LAC branch, the University of Ottawa archives, the War Museum Research Centre, the Bibliothèque et Archives Nationale du Québec (well, its regional office in Gatineau), and others. As of July, I added three new places to that list: the University of Alberta’s rare books collection, the Glenbow Museum and Archive in Calgary, and the Whyte Museum and Archive in Banff. In many ways these institutions differ widely in the focus and size of their collections as well as their access policies. Nevertheless, there are a few main commonalities. I thought that I would take the time to explain a few things and hand out a few pieces of advice for all of the awesome researchers who are just getting into visiting archives for the first time. Archives can be intimidating, but can be fonts of knowledge. If you have never visited an archive before but need to for research purposes, here are a few pieces of friendly advice for you. 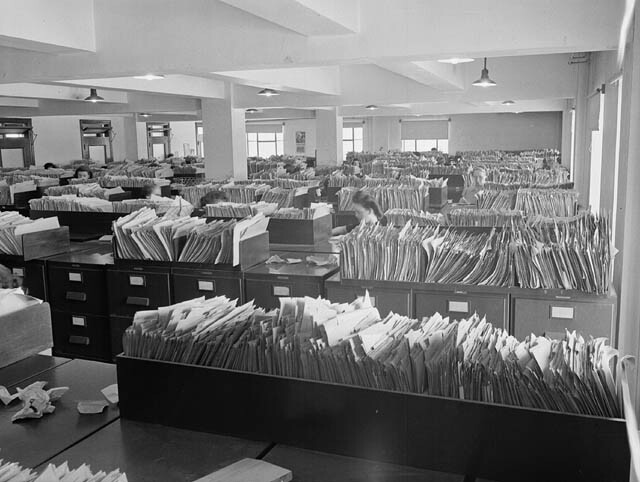 Wartime found Government employees working in poorly-lit, crowded offices such as the Records and Files Department of the Experimental Farm. Courtesy of Library and Archives Canada. MIKAN no. 3202901. I’ll get the most important piece of advice out of the way right off the bat: don’t just show up on the doorstep of the archive. Plan ahead. This is extremely important. Why? If you don’t, you will waste your time and the archivist’s time. Be prepared. How do you prepare yourself? 1) Know what documents you want to access ahead of time, insofar much as possible. 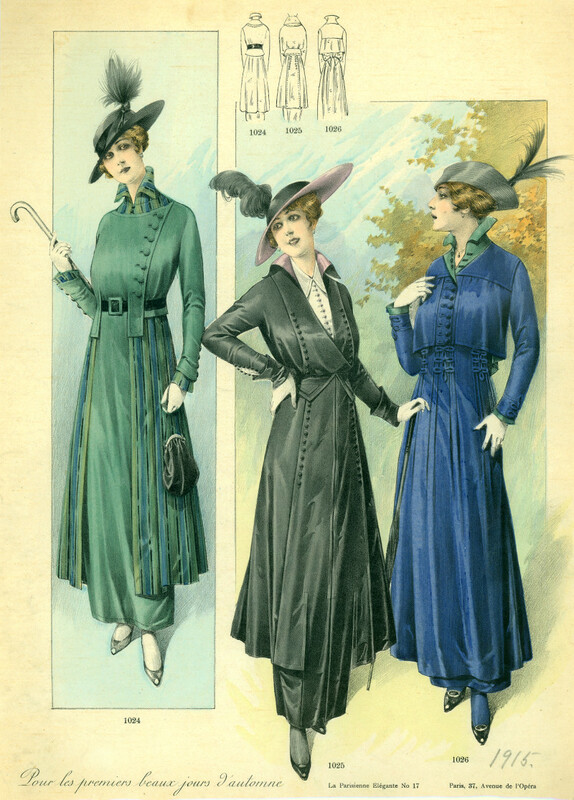 Does your archive have an online catalogue or database? Many do. Do some searching, find out what you want to see well before you visit. Ask what numbers are needed for the archivist to retrieve the files for you. Sometimes it is evident – i.e., there is only one call number/identification number, but in other cases (I’m looking at you, LAC!) there are a preponderance of numbers available: box numbers, MIKAN numbers, file numbers, accession numbers, system control numbers, and numbers from now-defunct systems of organization. Don’t be afraid send a message to the archivist asking what number as they need to find the box. Have these numbers and the names of the fonds/collections you want to access with you on the day of your visit. Print out any e-mail correspondence you had with an archivist; as I found out once, the archivist I had been in communication with was on holiday the day I was visiting, and the archivist on duty hadn’t been told I was coming and so didn’t have the call numbers on hand: that was in her colleague’s password protected e-mail inbox. It’s your responsibility as a researcher to know what you want to look at. Are any digitized images or documents available online, through the archive’s website or otherwise? If so, to avoid wear and tear on the documents you may not even be allowed to access the originals in person without a very good reason. That’s why there are copies online and made available, so the document doesn’t get undue damage from being handled over and over. Make do with the online content, particularly if you are interested in the information within the material, and not, say, the actual material reality of the document – like what paper it is made out of. 2) Contact the archivist ahead of time. Call or e-mail ahead to request information. Tell them who you are, a brief summary of your project (like, measured in sentences, or one small paragraph), what institution (if any) you are associated with, when precisely you will be coming to visit their archive, and what specific items you want to look at, including call numbers. The contact information is often easily found on the archive’s website, usually under a dropdown entitled “Contact Us” or “Planning Your Visit.” Often archives request at least three to five days advance warning of visits, particularly at larger institutions like Library and Archives Canada. This delay isn’t the archivists maliciously putting needless roadblocks in your way. There are good reasons for needing advanced notice to give you access to documents. For example, if you’re going to be looking at delicate material, like, say, nitrate photograph negatives (immensely popular from the 1880s to the 1940s), it likely stored in different conditions than textual documents and therefore may be in a different location. In fact, nitrate film should be stored far away from textual documents, in low concentrations and in cool conditions, to avoid the risk of degredation and spontaneous combustion. Yes, spontaneous combustion. In fact, Wikipedia has a whole page listing Ammonium nitrate disasters. Long story short, some documents may have to be stored in very specific conditions off site. When I visited LAC’s nitrate storage facility last month, it was way out in the boonies, far away from human habitation (fire regulations), and stored in concrete and metal vaults in varying temperatures depending on if it was about to be consulted or not. It’s taken from the coldest vault to a slightly less cold vault to acclimatize, then to a warmer one, then to room temperature. Even then, the boxes stay in plastic bags. You see, it can take up to three days to acclimatize the documents properly, and then it has to be shipped to a place where the researcher can consult them, which could be in a different city – or province. So, it’s not often just a simple matter of asking the archivist to go to the back room and collect the boxes for you. Don’t expect your documents right away, or even that afternoon. If you’re only in town for a few days, calling ahead is a priority. 2.5) Does your archive require an access card? LAC certainly does; you need your identification number to order anything, and must order the card ahead of time so it’s ready for you when you arrive. Other archives, particularly smaller ones, you can generally access without one after giving your name at the desk. Some may request you to leave ID. 3) Know your archive’s opening hours. In this time of fiscal responsibility and belt-tightening, archives are unfortunately one of the first things to get their funding cut. Out of sight, out of mind: people don’t realize how much maintenance and public service archives provide. So, often, archives have limited hours. During a staff open house at LAC last month, we had the chance to watch archival footage from the 1970s lauding the fact that LAC was open 24 hours a day, seven days a week, for the dedicated researcher. Archivists in the room laughed, ironically, or maybe a bit bitterly. It’s hit or miss as to whether an archive is open on the weekend – often they aren’t – and some archives aren’t even open for the five work days of the week, but on odd days, or only by appointment. Sometimes they’re only open for three days a week. Sometimes there are longer hours if you’re only looking at microfilm and don’t need as much supervision. Sometimes smaller archives close for an hour around lunchtime. You should also check for holidays. 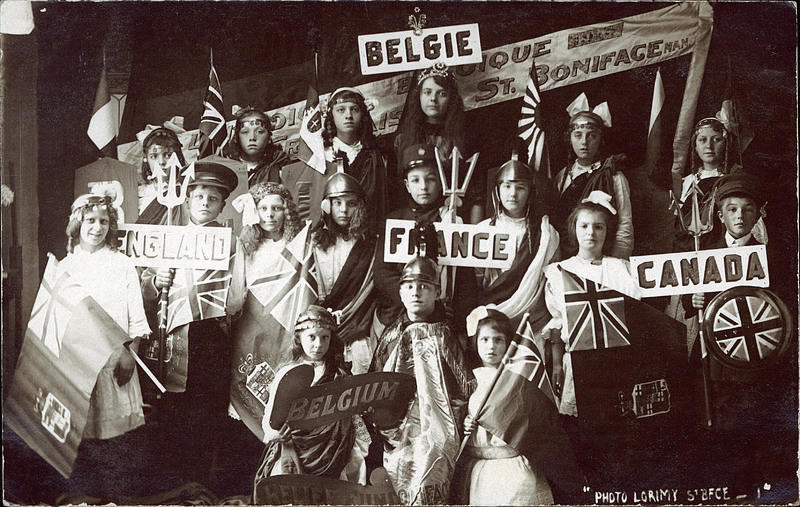 Particularly if you’re doing research in a region or country that is not your own, there may be local or national holidays for which the archive is also closed. Check ahead of time; don’t be caught out upon your arrival. If you’re coming from out of town, plan your visit carefully. If possible, give yourself an extra day on top of what you guestimate it will take to go through the documents at the archive. Maybe it will be a wash and they won’t have what you want. However, there may be unexpected delays in retrieving your documents, or, ideally (and this has happened to me), there is far more useful material than you anticipated and you need longer to go through the documents than you thought. Give yourself the ability to stay for extra time if you need it. If photography is not permitted, are there photocopiers available for researchers? What charges are associated with making copies? Note: all archives should ban the use of pens and the presence of food and drink, even water, around historical documents, for conservation purposes. Do not try to sneak them in. Many institutions have lockers or cubbies for your valuables and your refreshments. Does an archivist need to be present when you examine the documents? Are there stands and spacers available so you don’t damage the spines of bound documents by opening them incorrectly? Are researchers permitted to make copies (photographs, scans, photocopies?) of the documents, and what paperwork needs to be filled out to do so? Some institutions require you to fill out a form for each copy, some require you to place a little acknowledgement card in the frame of each photograph. Note: most, if not all, archives ban the use of flash photography because light can damage archival material. Can your documents (particularly if they are non-textual or oversized) be viewed in the normal reading room – or building – or must they be viewed elsewhere for conservation purposes? Some pieces, for example, particularly artwork, in the LAC’s holdings can only be consulted by researchers at the Preservation Centre in Gatineau, QC, which is about a 20 minute’s taxi ride (longer by bus) across provincial boundaries from the consultation rooms at 395 Wellington Street in Ottawa. In the case of fragile documents, they aren’t shipped to you; you go to them. Does the institution require you to wear gloves? Some archivists insist upon it to protect the documents from the oil on people’s fingers (especially if it’s photography), but others believe that loose gloves and fumbling hands do more to damage documents than any residue on clean and dry hands would. First and foremost: follow the instructions of the archivist in front of you. Don’t try to argue with them. It’s often not them making the rules, but the institution – and definitely not you. They control your access to the documents, so follow their rules. 6) Consult the archive’s FAQ page. So many of your answers will be found there. However, don’t be afraid to ask your friendly neighbourhood archivist! The front end staff are there to help researchers. In theory, it is their job not just to be the guardians of storehouses of knowledge, but gatekeepers. The mandate of Library and Archives Canada is to “preserve the documentary heritage of all Canadians” … AND “to be a source of enduring knowledge accessible to all.” (Emphasis added.) Archives are generally supposed to make information publicly available, unless they have very good reasons for going against their inherent reason for being (i.e., because of preservation, privacy, or national security restrictions). The archivists are there to help you, the researcher, do something with the documents under their purview. Most are generally helpful if you are respectful in return. Caveat: not all archives have enough funding, staff, or staff training to be as helpful as one would like. This list of general advice is based on my experiences with Canadian archives. A friend of mine working as a research assistant and performing research in the UK and India (yes, we are all exceedingly jealous of her) struggles to find basic and clear finding aids in the regional archives, and is often confronted with the fact that some documents in the archives’ own catalogue just are not in the holdings. For more tales of adventure and woe from these archives, please see her travel/research blog posts on the subject. Some archives are more organized than others; some don’t have any websites or online databases at all, or don’t have a complete catalogue of all of their holdings. It may be in the building, but it may be impossible to find. Your archivist is your closest ally in this endeavour. I cannot stress these points enough. Contact your archivist early, be grateful and enthusiastic, and be respectful of their time. A bored archivist is a rare being; with staff cuts everywhere, they often have more work to do than they should rightfully be expected to perform. If they have time, and especially if they show interest, tell them about your project. They often know their collection better than you do, and they may be able to suggest fonds or collections that would never have occurred to you. If you speak with them for any length of time, give them your business card. (Yes, you should have a business card, even as a student, with your name, e-mail address, associated institution,phone number, possibly a URL to a professional online profile like a research blog or work Twitter.) Sometimes they will contact you at a later date with more information. It really depends upon the archivist. Always be prepared. Your visit will be so much more productive and will go so much more smoothly if both you and the archivist know what to expect. Happy researching!